How can this not be a first impression? Has anyone ever finished Gloomhaven? It’s so big and so immense in its scope that I fear that it can’t live up to the expectations I’ve created in my mind. I still can’t believe how heavy the box is when I lift it up. Trying to put away this game is a logistical nightmare (buy some plano boxes NOW if you’re planning to get it). There are hundreds of cards, dozens of enemy standees, nearly twenty classes to choose from, and just shy of 100 scenarios to play. The closest competitors to Gloomhaven in terms of size and scope are the games in Fantasy Flight’s Descent line, but while you get more minis there and perhaps more content if you load up on hundreds of dollars in expansions, when it comes to base-set generosity, Gloomhaven is in a completely different league. The level of strategy and choice doesn’t compare either. 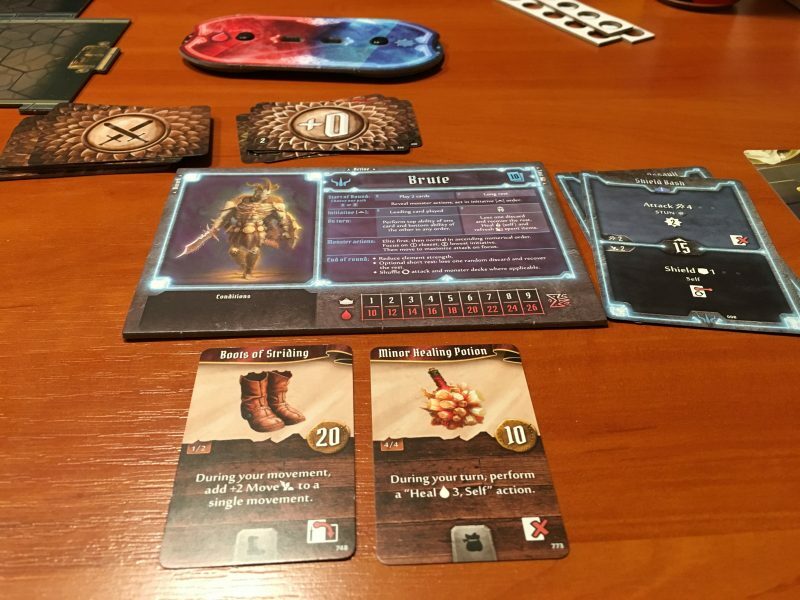 Descent is a good time of dice rolling with some strategic considerations (though it can be “gamed” fairly easily), but Gloomhaven gives everyone tough choices nearly every single turn. It has a wonderfully varied card system the eschews dice completely and it manages to be fully cooperative with an exceptionally simple system for controlling enemies. Time and time again, I’ll look at a design choice here and think “why isn’t this normal for this kind of game”? I feel like this description sells it short, but Gloomhaven is solid through and through. I purposefully did not research much about the game before I received it from the most recent Kickstarter printing. I knew that it was kind of a legacy game with tons of content and a card-based combat system. For a while I’ve speculated that my perfect game would be Mage Knight legacy, and before playing Gloomhaven I secretly wished that this would be that game. It’s not that perfect game, but boy is it close. I need to go through more of the campaign before I know if it’s going to be an exciting narrative experience or generic, inconsequential drivel, but right now I don’t want to play anything else. Gloomhaven feels right. I think I get this comfortable feeling because Isaac Childres has approached the design similarly with how I might have tried to do it. He could have easily packed the game full of minis for each of the enemies and sold it for 5x the price. He might have been able to make more money that way (just look at what does well on Kickstarter). Instead he took a giant box and filled it with actual content for the game. The stack of potential enemies is delightfully large, because fighting the same enemies over and over gets dull. Character leveling and upgrading is modest–you get a couple more health points at most and one new card to choose from when constructing your deck. But since every class is so unique and so interesting, and because you can only have around 10 cards in your deck for any given mission (depending on class), that one card choice feels great and impactful. Instead of having a ton of choices on leveling up there’s a huge stack of item cards. But you must, through various quests and decisions, acquire over ⅔ of those items unavailable to you at the start. Every time you travel you get a short story vignette with a decision. Those can give you gold, take away experience, help or hurt your attack modifier deck for the next scenario, and who knows what else. Most of them are not available at the beginning. They’re generally well-written and provide some contextual grounding to your adventures across the land. The point is that Gloomhaven leaves a lot to be unlocked and explored, which I absolutely love. There’s a transition point in any game where you start to understand it on a deeper level. If there are cards you begin to recognize them more and more–you start planning your strategy around them. If there are multiple strategies, you begin to pick them apart and understand which are best or how to counter any used by your opponent. Before that point the game has an ethereal, mysterious quality to it. You’re still discovering how it works and you’re still surprised by new revelations. I love that part of the gaming experience, and I find that only the best games can survive past it. The mark of a truly excellent game is one that is still compelling, challenging, and interesting when it’s become more math than experience. Other games have a longer shelf life in the first realm. They feel boundless. Gloomhaven, I think, is intentionally designed to feel like that as long as possible. This is partially due to the campaign nature of the experience, where you’re getting new scenario after new scenario. Pandemic Legacy has this feeling to it, but was betrayed by the constant fear of doing something incorrectly and by the limited size of the campaign. Gloomhaven is so big that I want to keep exploring its secrets. It will be betrayed only if there’s nothing more, narratively or mechanically, beyond what I’ve seen through the first 10 games. Technically Gloomhaven is also a legacy game, though due to how long it’ll take to complete the full campaign, it dissolves any concerns of not getting your money’s worth. You start with a map (beautifully illustrated in that Tolkien-esque way we’re all familiar with) with nearly a hundred numbered locations on it. As you unlock scenarios you’ll sticker that map and be able to see what dungeons, grottos, and other places of interest for a band of mercenaries are there. The map didn’t need to be mounted, nor did there need to be stickers, but Childres recognized (correctly, I think) that exploration and discovery is inherently fascinating, even when it’s so shallow as stickering a name on a map. There’s a childlike sort of glee that accompanies it. Every game I open up the map and wonder what hides behind each unrevealed location. I just realized I haven’t even talked about playing the game yet. Every character comes with a deck of cards from which you must select roughly 10 to make your deck for each scenario. Similar to Mage Knight, each card has a top and bottom half with different effects. Unlike Mage Knight, on each turn you will select two cards from your entire selection. You pick one to determine your initiative (each card has an initiative number), and then when your turn rolls around, you have to do the top half of one card and the bottom half of another. This restriction allows for some interesting design decisions. I haven’t really looked at any of the classes other than the one I’m playing (the psychic mindthief!) but nearly all of my cards that allow movement have that ability on the bottom half. In addition, there are a number of abilities on my cards that can only be used once before they’re gone (“lost” in game terms). Many of those abilities are on the top half of cards that provide movement on the bottom half. What Childres has done here is simulate fatigue within the process of playing cards. In addition to losing powerful abilities after you use them, every time you refresh your hand through a short or long rest, you have to “lose” a card. Thus, as you skirmish and delve through the dungeons your pool of abilities shrinks until you can’t play two cards and fall, exhausted. It’s simply a beautiful design that shines even more when you’re trying to cooperate with others on what to do. It allows people to go out in a blaze of glory, exhausting themselves to the benefit of the group, while others play more ineffectually, but conservatively. Initiative has its own set of interesting decisions. Generally in this kind of game or RPG, better initiative is strictly better. Here it’s more murky, for a few reasons. First I need to explain the elemental magic system. There are 6 elements available to manipulate by magic powers, but in order to use one of them it needs to already be infused into the battlefield. You can’t infuse an element and use it in the same player turn, but you can try to coordinate with someone else to pull off a combo play. Unfortunately, once an element is used it’s gone until someone else regenerates it, so there can be some competition between allies of who gets what. Initiative also matters spatially, because enemies can’t be passed through and you may need someone to kill a goblin so you can fly through a door, guns blazing. Finally, initiative is the tie-breaker when it comes to monster targeting, which means that monsters will target you more frequently if you play earlier. For my psychic rat who has very few hit points but lots of good initiative cards, this is an intriguing trade-off. Splitting the party always works, right? Monster turns are handled through a stupidly easy automation system that, frankly, shows up anything I’ve ever seen before. Each monster type has a small deck of cards that determines their initiative and what kind of actions they’ll do that round. Usually that involves moving and attacking with some kind of modifier (so a card might say Move +0; Attack +1, which means that it’ll move at normal speed and attack 1 stronger than its base power). You determine the shortest amount of distance a given monster will need to move to attack someone, and move them there. Ties are broken by initiative order. That’s basically it. It’s understated and elegant and perfect. I can describe the level-balancing system the exact same way. You determine the scenario level by essentially averaging everyone’s character levels. The scenario level determines how strong each monster is, how much money can be gathered (each monster drops a single coin token upon death like some kind of fleshy vending machine, and the value of that coin varies), and how much bonus XP is gained if you win. The number of players determines how many monsters spawned and how many of them are elite. So far I’ve played and both 3 and 4 player counts, and every single scenario has seemed adequately challenging. I can’t even imagine what kind of work went into figuring out the balance of them all, but bravo. Even though the game is cooperative, there are a few individual incentives that liven up the gameplay just enough without sacrificing the feeling of teamwork. First, each character has a secret overarching goal that defines them. Once they finish that goal their character will retire, and….something will be unlocked. New characters, I assume. But also other things. Maybe? None of us have retired our characters yet. Additionally, each player will have a secret goal for each scenario. Achieving those goals will help their characters get perks, which improve their attack modifier decks. In some ways this is more significant than other ways of advancing the skills of your character, because the modifier deck is drawn from whenever you attack someone. It starts with a roughly equal balance of +1 and -1 cards, with a complete miss and a 2x critical thrown in. I can see a fully leveled character having nothing but amazing cards in their deck, and that’s powerful. The final individual incentive is with experience points. Instead of gaining points when killing monsters you gain points by doing awesome things (like your once per scenario abilities). I’ve found that these individual incentives provide a nice tension against the cooperation of the group. What helps cooperation is just how varied each of the classes are. You largely feel like you’re playing your own individual role in the party because every one of your cards is completely unique, and the classes don’t necessarily fit the mage, healer, fighter, barbarian mold. It’s more interesting than that. The fantasy world created here feels familiar, though it contains what seem to be completely original races and creatures. It’s decently captivating, though I would have loved if it was truly original and bizarre. The art is similarly appropriate, and takes cues from Tolkien and D&D as you’ve come to expect. For that kind of generic fantasy setting it works fine, and I like seeing the new stuff (like my rat character) much more than the tried and true (elemental golems and drakes). Where the art suffers is with the logistical side of actually trying to set up each scenario. Identifying which map tiles to use is fine, although necessarily annoying on occasion. What isn’t fine is the frequent ambiguity of what certain terrain tiles should be placed. Let me give you an example. There are a few different types of terrain: obstacles, hazardous terrain, doors, traps, etc. Each one is signified on the scenario set up by a different colored border around them. The problem is that some of the colors are simply too close to each other. Like, different shades of purple. It’s already a tiny image, and I’m supposed to decipher which shade is being used? Even more of a problem, logistically, is how to even organize everything in the box. The kickstarter advertised a custom insert, but that only holds the cards. 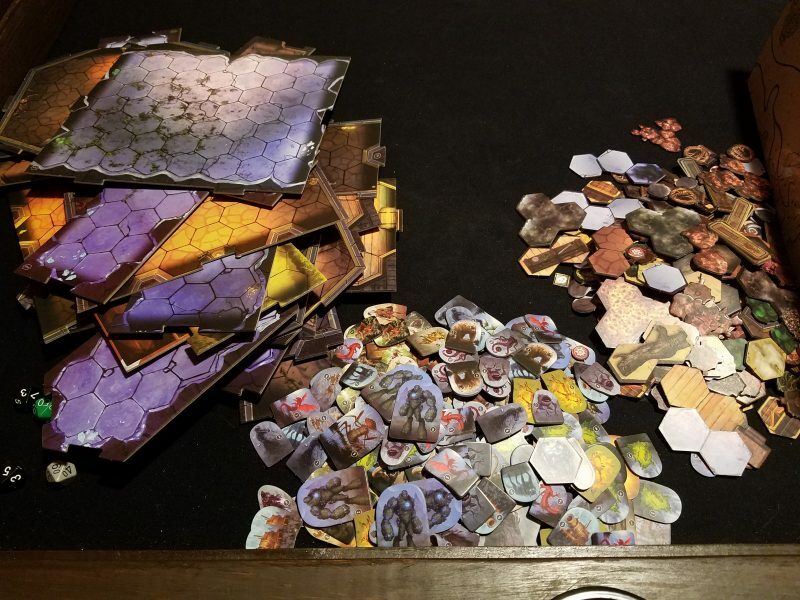 The bigger problem is all of the cardboard pieces for terrain and monsters. I’ve never done this before, but I bought some Plano boxes to try to rein it in. I’m considering dropping a sizable sum of money on a custom insert. Even then the set up and tear down will be substantial. For a game that might only take 45-60 minutes per scenario with 2 players (closer to 2 hours with 4) that can be an issue. Fortunately I’m in love with the game so I’ve been keeping it set up on my table between sessions frequently. If you’re not so enamored, I don’t know if the logistical hassle will make it worth it. Look at all that cardboard. The rulebook is also not ideal. I understand that making a rulebook for such a big game and fashioning it in such a way that you allow for new legacy elements to be revealed later is difficult, but I frequently have problems where I can’t remember where the information I’m looking for is actually located. There’s an extensive table of contents, but that sometimes doesn’t help. Additionally, we’ve had a few questions about combat that we’ve had to decide on the spot and try to look up in an FAQ later. That’s somewhat unavoidable for games of this complexity, but it doesn’t have to be this bad. Not the best rulebook. I don’t want to play anything else right now. We put our Pandemic Legacy Season 2 game on hiatus because of this. 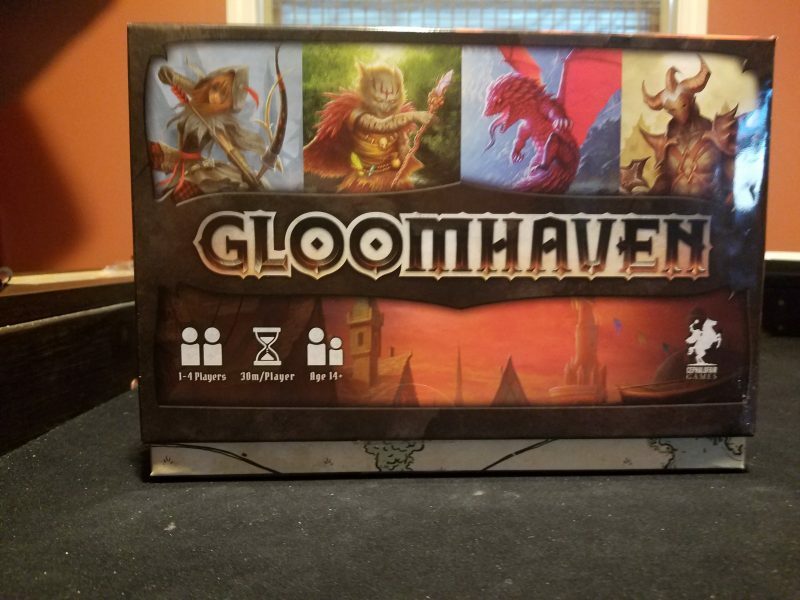 I’m offering plays of Gloomhaven as a reward for helping me play other games I need to review. I’m thinking right now of what missions I want to play next, and how I’m ever going to help my rat-man retire contentedly. I want to see what the high powered items are, and what kind of novel encounters I’ll see while travelling the countryside, and what’s in those other class boxes! I want to eat this game up, not necessarily because it’s blown me away with tons of innovations or spectacular minis or anything flashy like that. It’s flashy in that it’s so big, but all of that space is filled with gameplay meat. It doesn’t blow my mind with innovation, but it does do nearly everything right. Gloomhaven is a new standard bearer for this genre. Games aren’t going to be able to get away with lackluster non-choice gameplay and ride on the backs of their plastic or theme anymore. More than anything Gloomhaven feels comfortable. I feel like I belong in this world, making the kinds of tactical decisions I need to make with the cardplay, and discovering new story surprises. With a game so ambitious and so overwhelmingly large, that’s remarkable. The only thing I fear, and I repeat this a third time like an incantation, is that the narrative elements will disappoint. So far I’ve seen some branching with the story, which I like, but the story itself has been fairly generic. With all of this space I want to see what can be done with interesting narratives. I want to see what happens with retiring characters. The worst thing that could happen is that I get to the end of my journey and find some lame text slapped on. Maybe the gameplay and the reputation is blowing my expectations out of proportion, but I want it all. The floor for this game is that it’s the best tactical dungeon crawl experience I’ve played outside of Mage Knight. The benefit of that game is that you get to experience the entire arc of progress in one sitting–from level one weakling to city-smashing hulk. I’m ten sessions into Gloomhaven and my character hasn’t changed that much in their abilities. It’s a slow burn, but that could make it even better. The floor is high, but the ceiling is through the roof. I hope it pays off. I played a bit of this the other night. I say “a bit” because it was a joint effort to figure out how to play and it took a long time, so actual play time was cut short. It seemed to me that it tried really hard to use different, arguably more complicated, mechanics to accomplish what dice and skill bonuses accomplish in pen and paper tabletop rpgs. Idk. I guess I just have a hard time justifying the $200 price tag, impractical storage space, and giant rule book when D&D or Pathfinder fill the exact same “room”. The MSRP of Gloomhaven is $120. You are seeing inflated pricing because the retail shipments have not started. To play D&D, your group is in for at least $100 for one copy of PH+DMG+MM. Plus, you’d have to buy miniatures, if that is your thing. If your groups is happy with D&D or some other RPG, stay with it. My group has always struggled with getting someone to DM. We think Gloomhaven will scratch our itch. I view it as a dungeon-master-in-a-box. Steph – I think the “Why not just play D&D?” question is really good for games like this… For me, the two reasons to play Gloomhaven over D&D are the lack of DM (as Wayne says) and the fascinating card combat system. 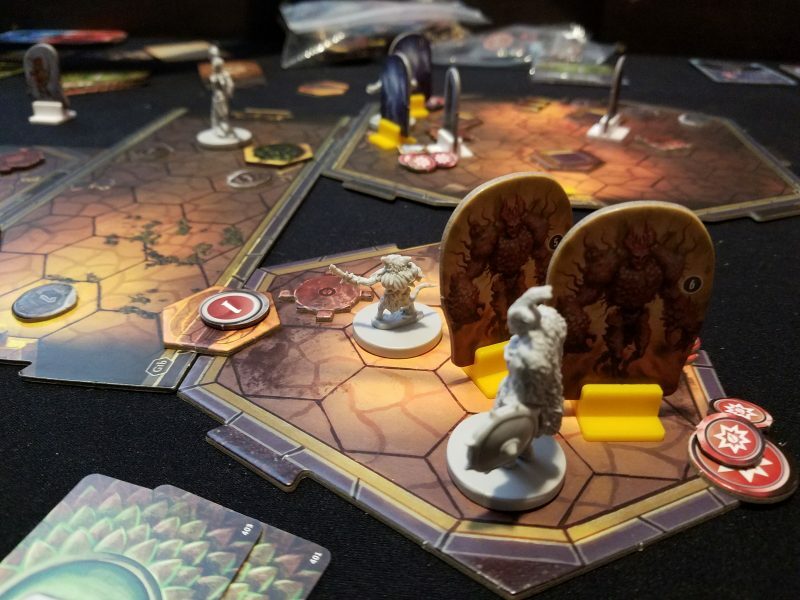 I think Gloomhaven actually succeeds at just being a board game – I’d want both in my gaming life. On the other hand, I’d be fine always playing D&D over Descent. Descent scenarios are imbalanced, which is made even worse since a DM was still required – and the combat is just a less creative version of D&D combat. So I’d say that the only reason to play Descent over D&D is the prep time. I agree that it’s successful as a board game, even though I personally feel like the “rooms” it fills in my house of “what I want out of a game” are similar to that of a D&D dungeon crawl adventure, and I’d much rather just do that. To each his own, I guess. Steph, I don’t see much of an overlap at all (also, is it retailing for $200?? The kickstarter was $100). DnD is about roleplaying of which there is basically none here. This is a tactical card-based combat game, and the actual gameplay decisions aren’t even in the same league as DnD. There’s no comparison. This is closer to Mage Knight. Not even close to any dice-based RPG combat system. Marc, I’d argue that d&d isn’t just about role playing, for me its been at least half, maybe more, combat wherein the decisions are very similar to what I encountered during my brief gloomhaven stint. 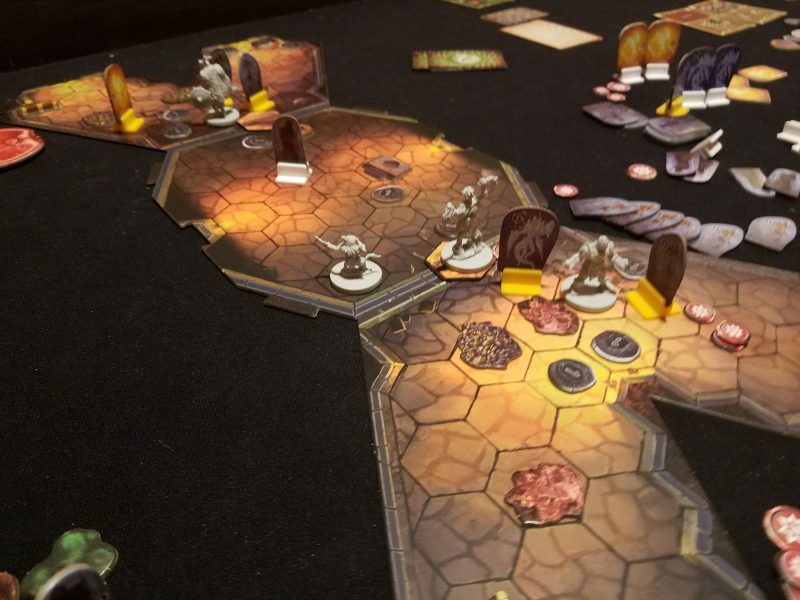 I’ve not played mage knight, but gloomhaven seemed like a constant stream of what I’d encounter in a dungeon crawl portion of a d&d adventure, with the same degree of complexity, without the role playing. So, for me its just not that exciting, even for what I guess is the accrual msrp of 120. I think the argument of “Its good because you don’t need a DM” is a good one, but that’s never been something my group has struggled with, so for me, I think I’d just rather dungeon crawl in a tabletop rpg setting. I think the idea of the game is a good one, and I think it meets the needs of certain groups really well, I just dont think its for me. That’s fair. I forget that DnD can be played with much more of a combat focus (I’ve avoided the editions that tend that way and vastly prefer 5e). Nice first impressions! I was rather skeptical towards the Gloomhaven hype before reading it, but there actually seems to be a good game in that giant box 😉 Still a bit deterred by the price tag, though, so at least as long as I still have my two campaigns in other coop games running, I’ll not go into Gloomhaven yet. Yet. Gotta prioritize your current campaigns, but this should honestly be the next one you do, especially if you have a group on board who will remain somewhat committed. Completely worth it. This game is awesome! I would suggest spending the extra money on the organizer sold by Broken Token. It makes setup and teardown significantly easier and faster. I also suggest downloading the Gloomhaven Helper app from Esoteric Software. It manages the monsters, elements and other aspects of the game electronically so you don’t have to try to manually keep up with nearly as much stuff. It makes the game go faster and feel more streamlined.